Jan Kepler‘s deep love of our local landscape is her design inspiration. For many, a simple stroll on the beach is just that; for Jan, it is an adventure of the senses. Her ability to transform those experiences into a palette of texture, color, and form for her interior design clients has been the key to her success. 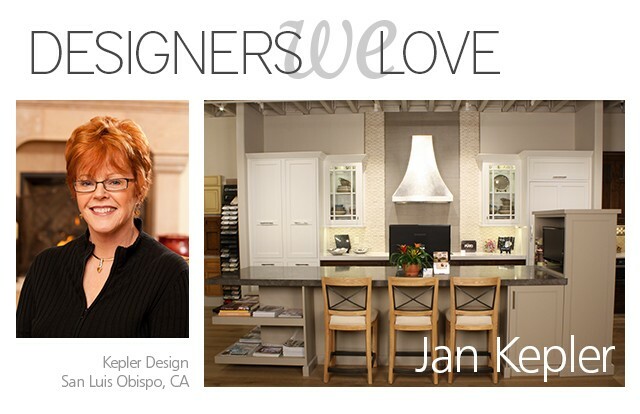 Jan has been incorporating Native Trails products into her kitchen and bath designs for over a decade. This symbiotic relationship has grown over the years, as our shared focus on enriching lives through design so often takes us on the same path. NT talked with Jan about a favorite project, mice, repurposing remodel waste, and her creative inspiration. JK: I have many favorites, but there is a ranch project that was a particularly wonderful experience. The home is located on more than 100 acres in the foothills of San Luis Obispo County. My clients had recently purchased the home and wanted to make it their own. They were just starting a family and wanted to make this home feel warm, casual and comfortable for themselves and their large extended family. It was one of my favorite jobs in large part because the clients were so great and easy to work with on the remodel of their home. They were open to a lot of ideas which made the whole process fun and exciting, and they wanted to buy local and use local artisans whenever possible. The job progressed to include most of the house and many of the furnishings. We had a lot of fun in the kids’ rooms as well as in the “man cave” and wine room downstairs. NT: What factors led you to select Native Trails for this project? JK: We started with the kitchen and when the clients came to meet with me, they fell in love with a rustic cherry kitchen display I had designed that included a Native Trails hammered copper apron sink and an island complete with a custom Native Trails hammered copper counter top. The look was exactly what they wanted, so we used the copper and rustic cherry cabinetry as the foundation for the remodel. To that we added stained glass and blown glass, handmade iron railings and light fixtures, stone work, concrete countertops, bronze hardware and new rustic alder doors and woodwork. A small portion of a fallen redwood tree became twisted, hulking mantels for the three fireplaces in the home. I have been a fan of Native Trails for years, which is why their products have always been so prominently displayed in my showrooms. I am thrilled that Native Trails is a local company owned by someone for whom I have so much respect as a person and as a business woman. NT: Wow. Thank you. The project does sound like a wonderful experience. Were there any challenging aspects? From a design standpoint, one challenge was that the previous owners had more formal taste and the house had lots of brick, along with all white wood work, cabinets and shutters. The clients wanted to change it all out, but we needed to repurpose as much of it as possible. NT: Keeping construction waste out of the landfill can be a real challenge, but is so important – some sources say as much as 40% of waste in the landfill is from construction! What are your solutions? JK: For this project, we were able to find homes for the cabinetry and window treatments with family members. Habitat for Humanity ReStore is a wonderful resource – they inherited a bounty of lighting fixtures and hardware for their customers! NT: We love your designs. Do you have any particular source of creative inspiration? JK: I love natural materials. I am most inspired when I am walking at the beach or in the forest. A mix of rocks and twigs and grasses will inspire a neutral color palette for a project. The shapes and shades of succulents in my garden are a source of inspiration. I love the look and feel and smell of wood – whether it is rough and weathered or polished to a high gloss. I am moved by texture, shape and color.